The Native Mulberry is a non-stinging nettle that produces fruit so delicious, you’ll be competing with the local wildlife. This is a fast-growing species that may be cultivated as a shrub or small tree. In nature, it can be found on the margins of rainforests in south-eastern, subtropical Queensland. You’ll also find it on the islands off the coast of QLD and across the Papuan Islands. The fruits of the Native Mulberry are small and white, almost translucent in appearance. Like strawberries, they bear their seeds on the outside. They are soft and juicy, with a sweet and delicate flavour, though like conventional mulberries, can vary in taste and texture. The leaves, roots and sap have recorded usage in traditional medicine, while the bark was used for textiles and cordage. Flowering typically occurs from January to June, with fruit ripening between May and July. Simply pluck the berries off the branch — though you may find the riper berries too soft to harvest easily. Native Mulberry trees are dioecious, meaning they may be male or female. They prefer warm climates, full sun and soils with good drainage. This rainforest species does not enjoy dry conditions, but can recover from droughts with heavy pruning. As a warm region plant, it won’t respond well to frost either, so gardeners in colder areas should consider keeping their trees in a hothouse or inside the home. Younger plants have been known to look somewhat leggy, but with clever pruning and care, a mature Native Mulberry fills out nicely, reaching heights of 3-8m even in a home garden. In fact, if a native edible hedge is what you are after, look no further. This species is a welcoming host for Jezebel Nymph, White Nymph, Speckled Line-Blue, Yellow Admiral and other attractive butterfly species. Will I need a male and female tree to get fruit? No. Although Native Mulberry is a dioecious species, meaning male and female flowers appear on different trees, the female trees will produce fruit by themselves. Male trees are only needed to produce viable seeds for the next generation. All Tucker Bush Native Mulberry trees are female. My Native Mulberry produces lots of leaves but no flowers or fruit. What do I do? Your tree might not be getting enough sunlight in its current spot. Try moving it to a sunnier position or removing shade objects to allow more light through. If you fertilise your soil, switch to a fertiliser with a lower nitrogen (N) percentage. The leaves of my Native Mulberry are turning brown and drying up. What can I do? Native Mulberry suffers in dry conditions, so keeping the soil hydrated and mulched through the warmer months can help the leaves retain the moisture they need to withstand a scorching summer. What is the sticky white fluffy stuff on the stems of my Native Mulberry? 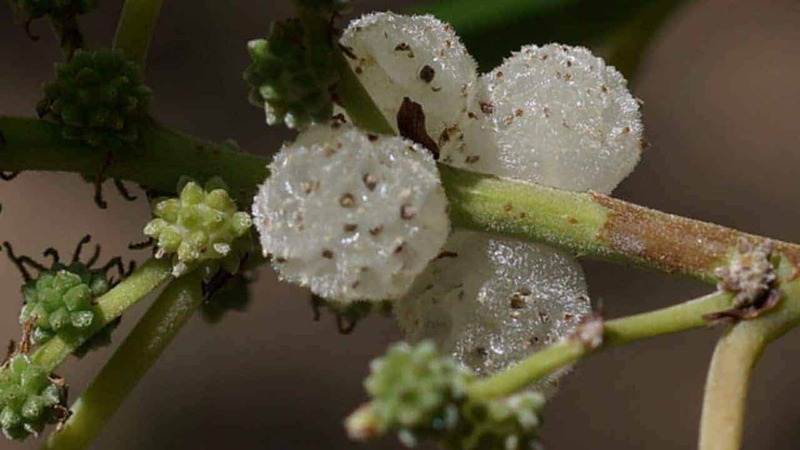 It sounds like you have a mealybug infestation. A few bugs here and there won’t harm a healthy Native Mulberry bush, but if the problem starts to get out of hand, give your plant a strong blast of water or apply a white oil/horticultural oil treatment according to the instructions on the packaging.